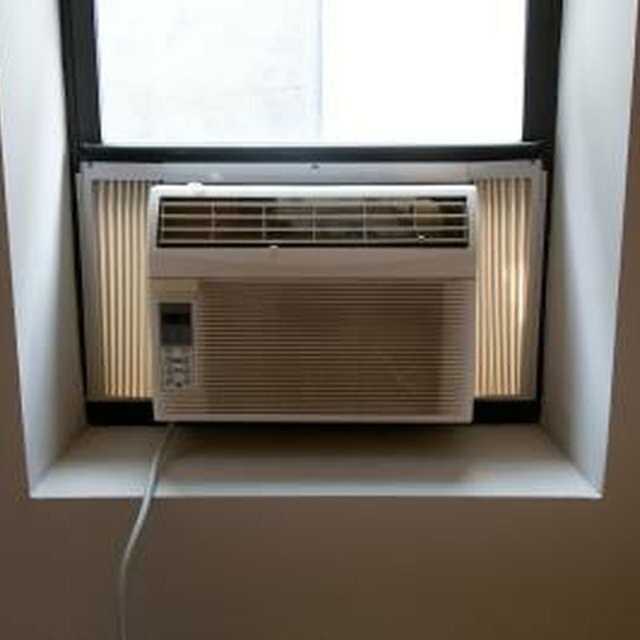 A portable air conditioner, such as the kind that hangs from a window, is used to cool a room or an outbuilding. Portable air conditioners are designed to run on AC, or alternating current, power. However, if the room or outbuilding you intend to air-condition lacks electrical service, you may choose to run the air conditioner using a heavy-duty lead-acid battery in conjunction with a power inverter. An air conditioner requires AC power, which a battery/power inverter combination can provide. An air conditioner is designed to run on household electrical voltage (120 volts in North America). While a lead-acid battery can provide enough power to run an air conditioner, the air conditioner cannot directly use the lower voltage (12 volts) or type of current (direct current versus alternating current) that a battery provides. A power inverter changes the direct current from the battery into an alternating current. This AC voltage is then passed through a transformer to increase the signal voltage to match household electrical voltage. Depending upon the air-conditioner's cooling capacity, the air conditioner can draw 1000 or more watts of power. An automotive battery can provide approximately 40 amp-hours of service (or 480 watt-hours). An automotive battery would therefore provide approximately 28 minutes of operation time (480 watt-hours/1000 watts) for the air conditioner To power the air conditioner for a longer period of time, choose a battery that has a large amp-hour rating. For example, a 255 amp-hour battery can provide approximately three hours of operating time for a 1000 watt air conditioner. A high-capacity air conditioner will cool a large room; however it will draw more electrical power than a smaller air conditioner. This will affect battery life and may unevenly cool the room or outbuilding. Over time it may cost more to run an air conditioner using a battery-operated system than it would to install electrical service in an outbuilding.